Unless you’re one of the trendsetters in Singapore, then it would be better for you to be extra cautious in choosing a pretty daring wedding look. Because even if the thought of wearing very long trains and lots of eccentric details might seem lovely, most of it are best left for the celebrities to wear. What are these styles? Read on to find out. 1. Leather Jackets. Although it may seem stylish, wearing your leather jacket over your gown might take the same road as the 1980’s headpieces. One smart solution to this? Take pictures of you with and without the jacket to see which style suits you best. 2. High-Low Gowns. There are a number of wedding silhouettes that we usually see time and time again like the ball gown, A-line, and the mermaid gown. Choose something outside that group, and expect the style to be out of the market 10, or even five, years from now. 3. Flower Crowns. 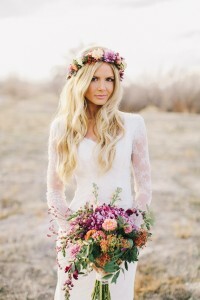 Similar with the high-low gown styles, floral headpieces seem to be the trend of the moment. But leave the crowns to the festivals and just go with the good old veil for your ceremony. 4. Colour Gowns. Colour – whether it’s blue, or pink – might make you standout, but you’ll definitely look back at your gown photo a few years from now with a big regret. 5. Wedding Shorts. Going on for a casual wear like wedding shorts is something that you’d want to avoid on your big day. Remember, it’s the most special day where you get the chance to put on the most extravagant outfit of your life. So why go for something so casual? 6. Capes. Although this would work for your dinner rehearsals and other wedding-related events, wearing it to your wedding day will definitely be a big risk to take. 7. Hats. This is perfect for any casual wear, so why let a large, distracting accessory take away the beauty of your gown. 8. 1980’s Headpieces. While your 80’s obsession may be off the roof, wearing this kind of headpiece will surely get your eyes rolling as you take a look at your photos few years from now. Being stylish during your wedding day is good. But what’s better is to make sure that you’re comfortable with what you’re wearing and that you look lovely on it especially on your most special day.